Without question, a leave-on AHA (alpha hydroxy acid) or BHA (beta hydroxy acid) exfoliant can make a world of difference in your skin’s appearance. We’re often asked which one is best, and the answer is less complicated than you might think. But first, let’s answer the question, "Why exfoliate?" Our skin naturally exfoliates dead cells every day, but over time—primarily as a result of age and unprotected sun exposure—this shedding process slows, and may stop altogether. The not-too-pretty results include dull, dry, or flaky skin; clogged, enlarged pores; bumps, wrinkles, loss of firmness, and uneven skin tone. Helping skin gently exfoliate its buildup of dead skin—the way it did naturally when we were younger—reveals the beautiful, soft, hydrated skin hiding beneath, as quickly as overnight. AHAs (alpha hydroxy acids, e.g. glycolic and lactic acids) and BHA (beta hydroxy/salicylic acid) act to “unglue” the bonds holding dull, dead skin on the surface. Once those bonds are broken—gently and evenly—skin naturally sheds. So, although you won’t actually see your skin exfoliating, you’ll soon see the smoother, younger-looking skin hiding beneath. To work effectively, AHA and BHA exfoliants must be formulated within a narrow pH range, between 3 and 4. 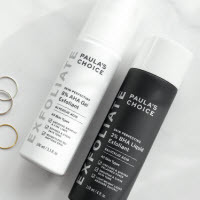 Paula’s Choice Skincare is aware of the research around this issue, so all of our exfoliants are formulated to be as effective, and as gentle, as possible. As with all of our products, they also contain unique blends of skin-soothing ingredients. But each also has unique properties making them preferable for certain skin types and concerns. AHAs work on skin’s surface, and are water soluble. They’re generally preferred for normal to dry, sun-damaged skin, due to their ability to enhance natural moisturising factors within skin. They’ve also been proven effective in reducing the visible signs of sun damage. BHA works on skin’s surface and inside the pore; it’s oil soluble, so it’s most often preferred for normal to oily skin prone to bumps, clogs, blemishes, and enlarged pores. BHA also has natural skin-calming properties, so it’s gentle enough for sensitive skin prone to redness and/or rosacea. This well-rounded, gentle ingredient is even suitable for skin prone to milia. With so many shared and unique benefits, we’re routinely asked, “Should I use both an AHA and BHA product to get the best results?” In short, no; either will provide remarkable results for various skin types and concerns. But there’s nothing wrong with using both or experimenting to see which one works best for you. A few notes on how to best combine AHA and BHA products. Most people will find it’s too much for their skin, to use an AHA and BHA exfoliant at the same time. Consider alternating: using one in the morning and the other at night, after cleansing and toning. Or alternate days: apply an AHA once or twice daily on Monday, a BHA once or twice daily on Tuesday, and so on. You do not need to wait for your toner to dry before applying your exfoliant, and you don’t have to wait to for your exfoliant to dry before applying the other products in your routine. If you have combination skin, where the T-zone is oily and clog-prone with large pores, but the cheeks are dry, experiment by applying a BHA exfoliant to the oily areas and an AHA exfoliant to the dry areas. Don’t forget your neck and chest! AHA and BHA exfoliants can exert their skin-renewing, texture-improving benefits there, too!